Enjoying swans and ducks on our lakes and waterways is one of the great pleasures of living on the Gold Coast. I’m often asked ‘what’s the best food for swans?’ It definitely isn’t bread. Bread is not good for any s pecies of bird. Their digestive system is not designed to metabolize refined flour, preservatives, yeast or refined sugar. And yet bread to a swan is like lollies (candy) to a kid. They’ll gollop it down. Same is true for ducks. Bread displaces the natural foods these birds should be eating. It’s very high in protein compared to a swan’s natural diet of water weeds. If they eat too much bread, for too long, they become weak and breed unhealthy young. If cygnets (baby swans) eat a lot of bread (or grains) they can experience a growth spurt causing their bod y to develop too quickly for their legs. They become plump to a point where they can barely stand or walk. Some develop a condition called ‘angel wing’ (pic at left) where the feathers on one or both wings grow out sideways. Birds with angel wing will never fly and are often bullied and shunned by fellow swans. 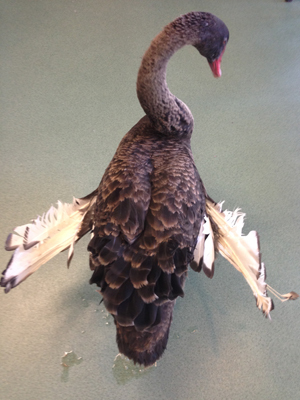 Swans, ducks, other water birds and domestic poultry can all develop angel wing from eating bread or being fed grains. If moldy bread is fed to swans or ducks it can kill them. You’ll notice that in the wild swans dip their head underwater. They do this to feed on the stems and roots of water weeds. These ‘green foods’ are a swan’s natural diet, supplemented by grasses on land and the occasional bug or insect. Rip up or shred some lettuce and add a little silver beet (not spinach). Swans love fresh corn off the cob (or canned) and fresh peas (defrosted). You can also add a little grated carrot and chopped broccoli into the mix (no onions or garlic). Cast this mixture into shallows where the swans can reach it (not onto grass or the beach). Alternatively, fill a low bowl with clean water and drop in handfuls of the mixture. Sometimes swans will feed from a bowl but they often prefer the mixture to be scattered in shallow water. This nutritious ‘swan soup’ is good for swans and ducks. However, don’t feel disappointed if they turn up their nose and give you a look that says, ‘OK, where’s the bread?’ Persist because they will get used to it. You can add a small handful of millet or mixed grains (from a pet store) but the less grains the better. It’s preferable not to feed wild birds at all, but if you insist it’s your responsibility to do the right thing and only give them food that’s ‘as close to natural’ as possible. That way they’ll grow into beautiful, healthy birds.